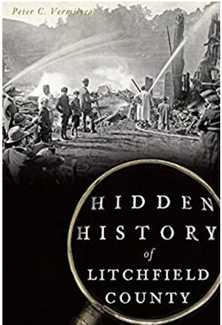 Pete Vermilyea presents "The Hidden History of Litchfield County"
Traces of Litchfield County's past are hidden in plain sight. Vestiges of long-abandoned railroad tracks crisscross the county while a decaying and unmarked cinderblock structure in Warren is all that remains of a cornerstone of national defense. All but forgotten today, a fire roared through Winsted in 1908, causing residents to flee their rooms at the Odd Fellows boardinghouse. In Bantam, art deco chairs made by the Warren McArthur Corporation prompted the War Department to order bomber seats from the company during World War II. Author Peter C. Vermilyea explores these and other obscure tales from the history of Litchfield County, Connecticut. Pete Vermilyea is the author of Hidden History of Litchfield County and Wicked Litchfield County. He teaches at Housatonic Valley Regional High School in Falls Village, CT, and at Western CT State University.